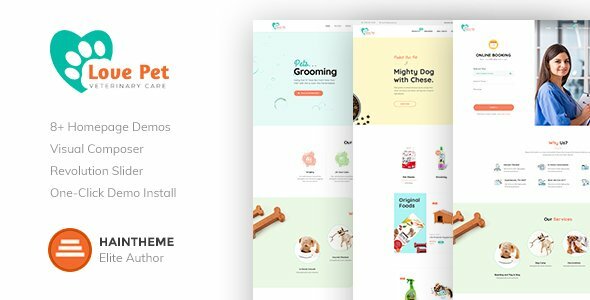 LovePet is a fully responsive pet shop WordPress Theme and manufactured for vet clinics websites. Make the use of your animal care site enjoyable for your customers by providing them with the schedule of your vet experts appointment form. Use our built-in Gallery to present all pets for adoption and happy clients that took their animals home, showcase your services, customers reviews, and veterinary experts professionally. Use online shop pages to display all animal products with the popular Woocommerce plugin. Spread your love to animals & pets all over the world with this veterinary clinic theme! Slider Revolution included: The award winning Revolution Slider is supported. This beautiful responsive slider allows you to create stunning effects for your site. WooCommerce Compatibility: this plugin is perfect for your shop or your clients websites as an agency or freelancer. Mobile Optimized Design: Quick and easy to use the most important thing for selling product on mobile. Blogging in Style: Give your blog and extra oompht! Language Translation: The theme includes the required .po & .mo files ready for translation. Easily translate using the Loco translate plugin, plug support for WPML & qTranslate for multi-language support.